I’m ashamed to say that I’ve never watched a Charlie Chaplin movie. 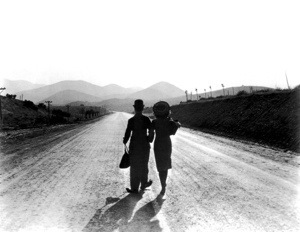 You would think that after absolutely loving The Artist I would have explored the silent era a bit. I also watched the Robert Downey Jr Chaplin movie years ago and found it fascinating so would like to revisit that once I’ve worked my way through the Chaplin films. 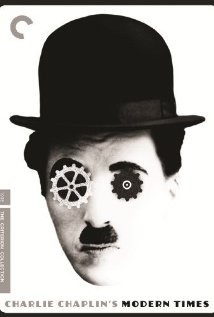 I’m not sure how to review Modern Times. I think I’m not going to say a lot at this point as silent era movies are something I know absolutely nothing about and I would feel weird talking about something of which I have zero knowledge. Charlie Chaplin was an absolute genius. The intricacy of each is just astounding. Yet he manages to bring a humanity to his films that is often lacking nowadays. I’ve always had a profound respect for silent actors. You don’t have words to use as crutches, only the visual aesthetic of your movements and expressions. I’ll have to check this one out. Thanks for the review! I love this movie! I think it plays every bit as well today as it did back in 1936. I’ve only seen a single Chaplin short, where he’s a watchmaker demolishing a timepiece in dozens of inventive and funny ways, and it was superb. I’ll make this my next Chaplin film! Definitely check it out 🙂 It’s actually gone up even more in my estimation since seeing it – it’s by far my favorite movie I’ve watched in a long time. I’ll be watching more of his movies very soon – just need to buy them! Want to check out City Lights next. How is your journey of Chaplin discovery coming along? Have you seen ‘The Great Dictator’ yet?